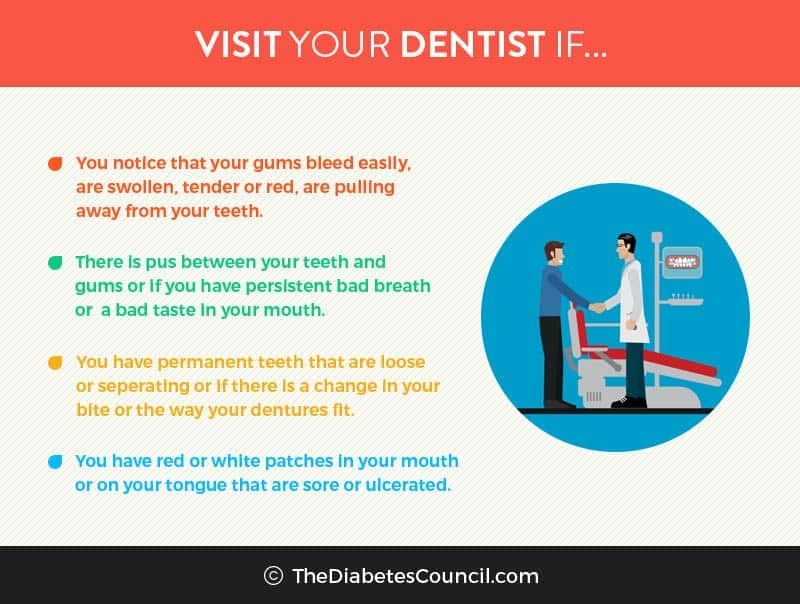 You are here: Home / Guides / Can Diabetes Affect Your Teeth And Gums? Did you know that trouble keeping your blood sugars in control could lead to an infection? That infection could be in your gums. That’s right. People with diabetes have a higher incidence of gum disease or periodontal disease than people without diabetes. In this article, we will look at the link between diabetes and periodontal disease. We will look at what it is, what are the prevention and treatment options available, some other oral problems that are also linked to diabetes, and more. Just like high blood glucose makes it easier for you to get an infection in other places in your body, high blood glucose levels also make it easier to get a gum infection, or other infection in your mouth. Decaying teeth and poor oral habits contribute to periodontal disease, as does smoking. We will take a look at all of that here. First, let’s see why Martin contacted TheDiabetesCouncil. Martin was interested in learning more about his high blood sugars and their effects on his teeth. He had been trying to get his blood sugar levels down, but nothing he seemed to do with diet, exercise, or medications helped in aiming his target range for blood sugars or in an A1C range that he was comfortable with. He was due to pay a visit to his dentist since his last visit was over a year ago. Martin’s dentist told him that he was at the start of a periodontal disease, and in addition, he had a gum infection. He wondered if the infection in his gums may be a reason for why he was unable to keep his blood glucose in a good range. An infection anywhere in your body could be a reason for unruly blood glucose. Let’s see if we can answer Martin’s question in depth. Periodontal disease is an infection that develops of the gum, and underlying bone, that holds the teeth in place. When periodontal disease is left unchecked, it can lead to worsening blood glucose control, due to the fact that there is bacteria in the gum or bone that hold the teeth in place. Chewing can also become painful, and loss of teeth may occur. What is your oral cavity? 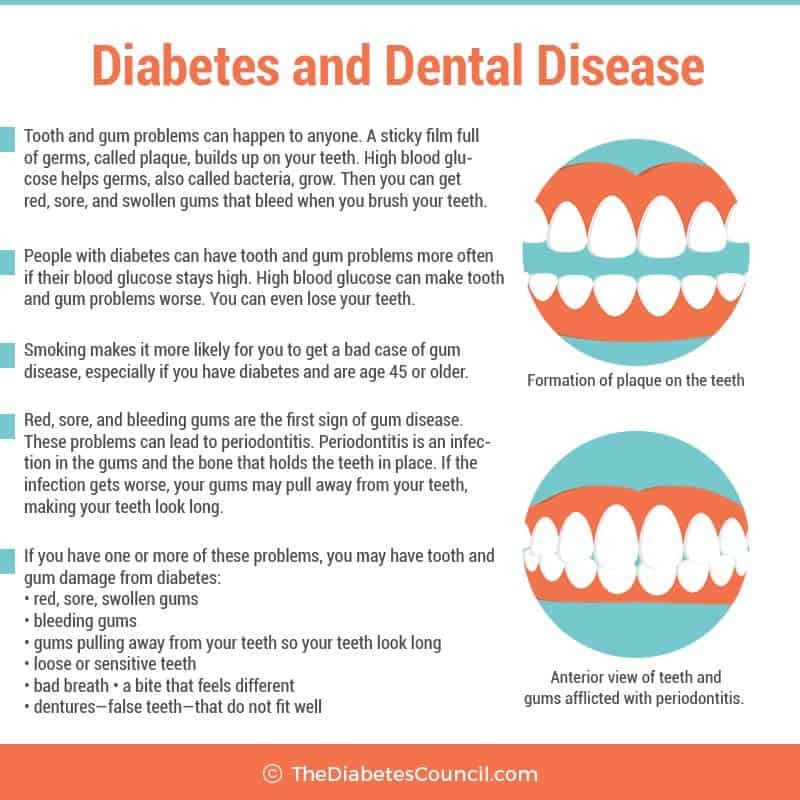 How does diabetes affect your teeth and gums? To understand how a gum infection could make your blood sugars go rogue or make you get periodontal disease that causes you difficulty chewing or to lose those pearly whites, let’s examine the relationship between diabetes and periodontal disease. Why is it that people with diabetes are prone to getting periodontal disease? 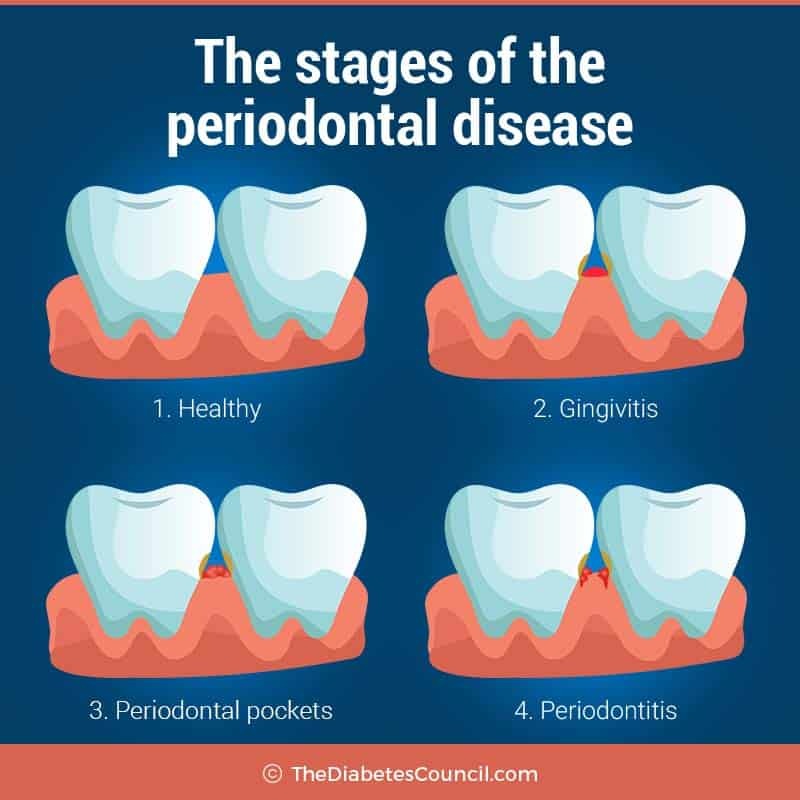 You may not like the answer here, but periodontal disease is just like any other complication of diabetes in that it is linked to how well you are in control of your blood glucose. Once again, self-management of your diabetes is key in the prevention of periodontal disease, in the same way that it is preventative of eye, kidney, or heart damage to name a few. There is also a link between periodontal disease and heart damage (specifically valve damage), but we will discuss that later. 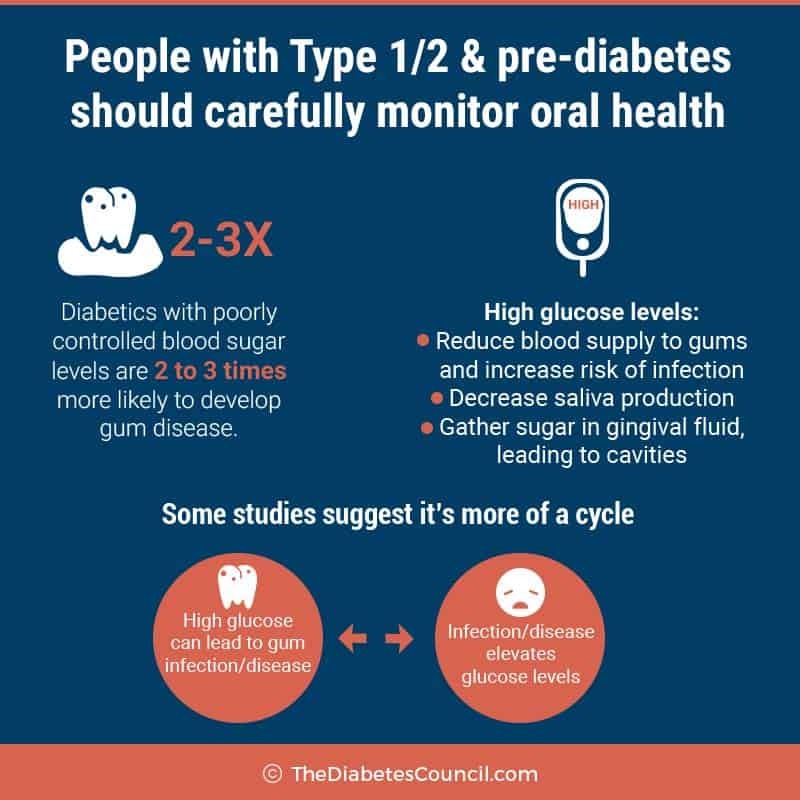 Not only do people with poor diabetes control get more gum disease than their self-managing peers, but they also lose more teeth. If your diabetes is well under control, you have about the same risk of periodontal disease as do those without diabetes. As I’ve said before, diabetes is really not the problem, high blood glucose is the problem. So managing that is the key to everything. If you have any of these symptoms, contact your dentist or periodontist for further evaluation today. Thickening of blood vessels in diabetes promotes periodontal disease. In diabetes, blood vessels which are responsible for delivering oxygen to various parts of the body are thickened. This slows nutrient and waste transport in and out of tissues. This tends to weaken gum and bone resistance to infection, and periodontal disease sets in. Bacteria grows freely in the oral cavity of a person with diabetes with poorly controlled blood glucose. This contributes to bacteria getting into gum and bone in the mouth, which sets a person with diabetes up for periodontal disease. For smokers, it is a double-whammy. Nicotine displaces oxygen in the blood stream to all tissues, including gum and bone in the mouth. Smoking gives you added circulation issues on top of the ones that you already have with diabetes. Smokers are as much as 5 times more likely than nonsmokers to have gum disease. In addition, it stains your teeth, makes your breath smell, and raises your risk for oral and throat cancers, as well as many other kinds of cancer. If you have diabetes, are over the age of 45 years, and smoke, than you have just given yourself 20 times more likelihood of developing gum disease than if you did not smoke. So why give yourself more problems than you already have? Contact a smoking cessation program in your area by calling 1-800-QUITNOW or 1-800-784-8669. Quitting smoking almost immediately lowers your heart attack, stroke, neuropathy, kidney disease, and amputation risk!!! Ask for support from someone on your Diabetes Care Team. 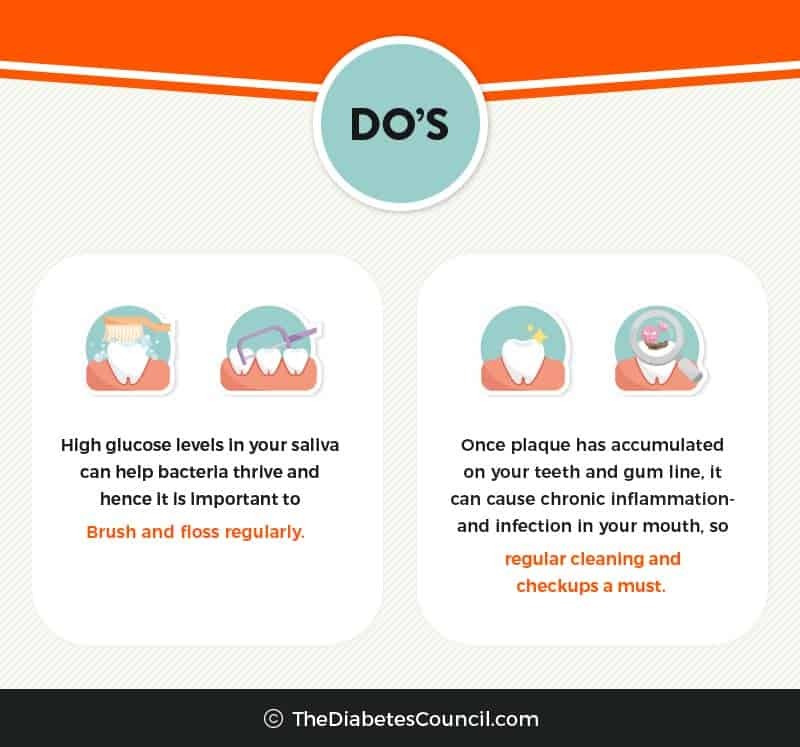 Diabetes with poor control (remember increased blood glucose equals more plaque), combined with poor brushing and flossing habits can lead to periodontal disease. Plaque build-up under the gum line occurs first. Then your gums will become irritated, swollen and may be reddened. You may notice that they bleed when you are brushing your teeth or flossing. This is just the first stage of periodontal disease, called gingivitis. This is also often called halitosis, or simply, bad breath. This can be treated with daily brushing and flossing, and regular dental check-ups, and is not so severe. Many people have had a case of gingivitis. When gingivitis is allowed to thrive in your mouth, the second stage, called periodontitis occurs. It is the infection of the gums that are underneath the teeth, and wrap around each tooth to hold it in place sets in. This is not a good thing, because the infection gets into little pockets of the gum, and causes plague to build up and harden deep under the gum surface. If it goes so deep as to affect the bone, tooth loss is possible. Remember when your mother said that you only get one set of teeth so you had better take care of them? This is what she was talking about. With periodontal disease, there isn’t any warning, because pain, abscesses, or tooth loss do not occur until the very advanced stages. Regular brushing, flossing and visits to the dentist will not be enough to treat periodontitis. A periodontist, or gum specialist should be consulted, or at least a general dentist with this special training and expertise, in the event that you have periodontal disease. Treatment is based on how much damage there is to underlying gum and bone structures. In the first phase, gingivitis, treatment will include cleaning of the teeth and gums, with concentration on removing plaque from around the gum line. The periodontist or dentist may have to remove tissue that has become infected from under the gum, or even resurface the damaged root surfaces by smoothing them out some. This will help the gums reattach to the teeth. You will probably have an antiseptic mouth rinse to do several times per day as aftercare. Brushing and flossing regularly, and regular dental visits are needed to keep the gums from becoming infected again. If gum or bone loss is severe, periodontal surgery may be required. When the tissues that hold the tooth where it is are no longer there, that is the only choice. The periodontist cleans out the tissues surrounding the underneath of the tooth, and may even build gum back in place or reshape existing gum. Treatment is aimed at saving the tooth from removal. When all else fails, teeth are lost. Thrush is a fungus of the oral cavity, or mouth. 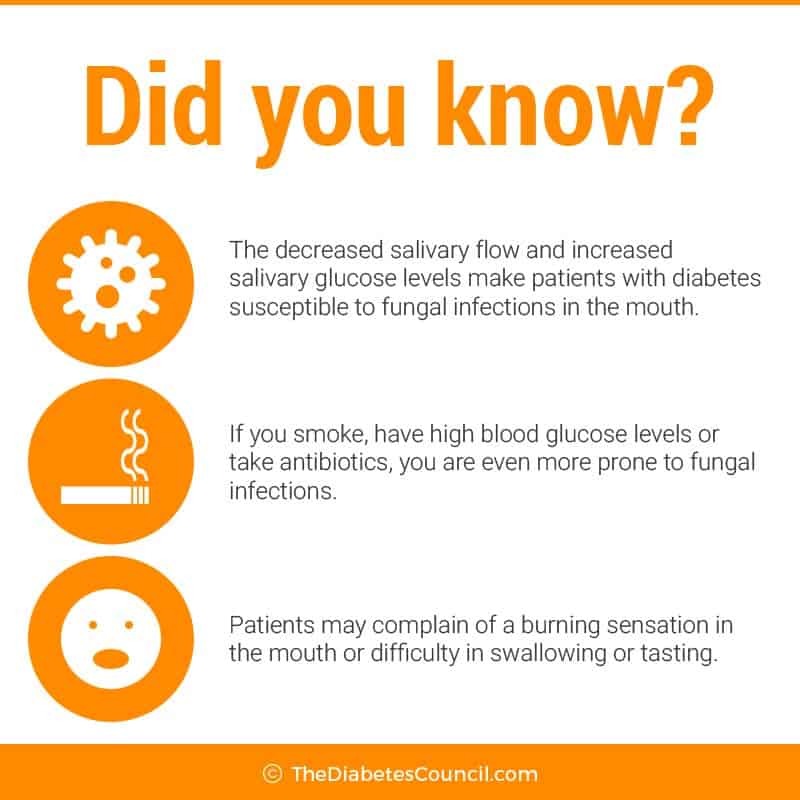 With diabetes, high glucose causes fungus levels to rise in the mouth. Wearing dentures, or smoking, also increases the risk of thrush. An oral suspension is usually given to the patient to swish and swallow several times per day to cure this infection. To prevent it, keep your diabetes in check, clean dentures regularly, and do not smoke or use tobacco products. Dry mouth can cause your mouth to be sore, can cause infections or ulcers in the mouth, or even tooth decay. It is sometimes a sign that a person has diabetes. This is because when your mouth is dry, there is no saliva. Saliva provides protection against bacteria. Saliva coats teeth with needed minerals, and washes away food particles from around teeth. This promotes the growth of microorganisms in the mouth that can cause gum infection or tooth decay. Be sure to check with your pharmacist that your medications are not causing your mouth to dry. Many over the counter and prescription medications can cause dry mouth, in fact the list is quite extensive. Artificial saliva may be prescribed, and may help with the symptom of dry mouth, while not only uncomfortable, can contribute to periodontal disease. Again, good control of blood glucose is key to preventing dry mouth. If blood glucose levels are not controlled well, it can lead to a condition known as oral burning. A bitter taste may accompany the burning sensation, along with dry mouth. Often these symptoms get worse as the day goes on. Type 1 diabetes doesn’t seem to cause any more cavities in children if well controlled. Some children with good control even have fewer cavities than their non-diabetic peers. This may be due in part to a reduction in sugar content of foods since most kids with Type 1 diabetes don’t have much raw sugar or sweets in their diet. Seeing the dentist every 6 months, for routine check-ups, needed X-rays, and cleanings is very important. If your need any treatments that are non-emergency, it is best to make sure your blood glucose is in control before having them done. Your dentist should know that you have diabetes, and should know what medications you are taking. If you take insulin or other glucose lowering medications for your diabetes, you may want to take along your medication bottles to show your dentist. Make sure to eat something before your visit, so that you don’t have an unnecessary low blood glucose during your dental visit. Take your diabetes medications and a snack with you to your dental visit if you need to, or in case you have a long wait time. If you are nervous about any of the procedures that you are having done, talk to dental staff. They are used to calming worried and nervous patients, and waiting only makes your dental problem get worse. 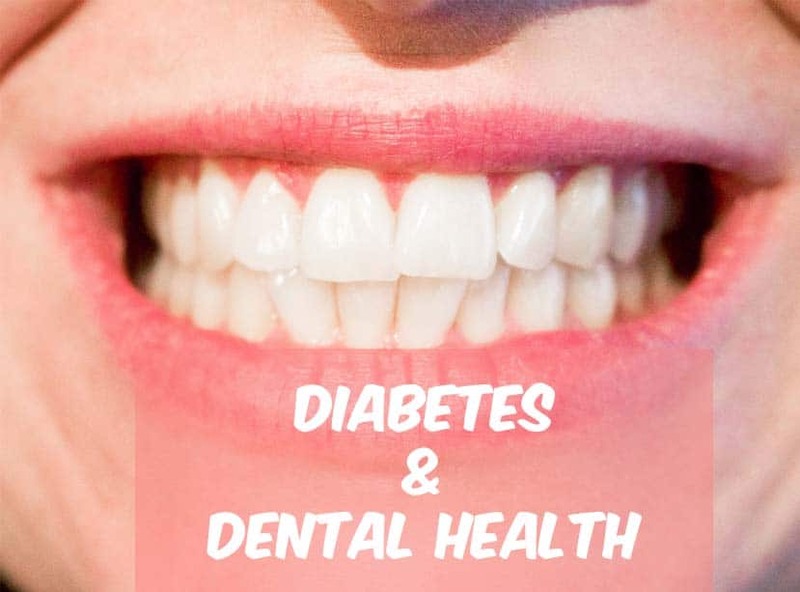 It’s best to take care of it, since worsening gum disease causes diabetes to get worse, and worsening diabetes causes problems with healing of infections related to gum disease. What if my mouth is sore following a dental procedure? If your mouth is sore following a cleaning or other procedure, ask the dentist what foods or liquids it is ok for you to have, and what time and when you should take your medications for diabetes. Ask about any medication dosage changes, and if you should be checking your blood glucose more often after the procedure. If you have upcoming oral surgery, you will want to speak with your dentist and staff about your diabetes and any medications that you are taking. 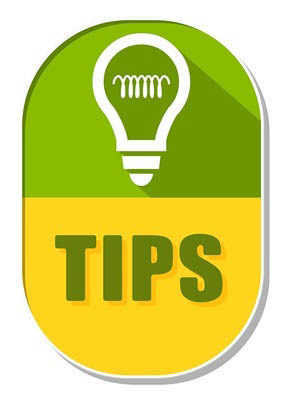 Ask about meal planning, and dosage and timing of your insulin or other medications. Postpone if blood glucose is not in control unless in the case of an oral emergency, such as an acute abscess. Diabetes and Anemia: Are They Related? If your diabetes is in good control, you may be able to get any periodontal surgery needed right in the dental chair. Once the infection is taken care of, look for your blood glucose to normalize, and for it to become easier to manage your blood glucose. Let’s face it. You only have one set of permanent teeth so the purpose is to take care of them and prevent all of these serious gum and bone problems that can happen if you don’t take care of your teeth. So what is it that you can do besides the daily brushing, flossing, and six month check-ups to your dentist? For starters, check your brushing and flossing efforts by using a red “disclosure tablet.” These tablets can be purchased at the pharmacy, and they stain any remaining plaque red so that you can see where you missed. Then you can brush the rest of the plague away. You should check your mouth often if you have diabetes. If you notice any problems, such as dry mouth, or bad breath, consult with your dentist right away, and don’t wait for problems to worsen. If you already wear dentures, and have some degree of periodontal disease, it can make your bones and gums uneven. Your dentures may not fit well in that case, and you may have pain upon chewing, or difficulty keeping your dentures in place. Having the best fit for your dentures is important. Mouth pain from chewing on improperly fitting dentures may make you more likely to choose foods that are softer, but not always best for your meal plan. See the professional who made your dentures to discuss a remedy for an improper fitting set of dentures. Studies have shown that severe periodontal disease can even CAUSE diabetes. Researchers at Marquette University found that periodontists raises the levels for inflammatory cytokines and serum lipids. Cytokines are what can produce a syndrome similar to insulin resistance which is what is observed in diabetes. This can in turn initiate pancreatic beta cells destruction which can further lead to development of diabetes. Periodontal disease and diabetes both cause inflammatory responses all over the body, which is why one can make the other worse, and vice versa, according to researchers. In addition, research has shown that periodontal disease also worsens erectile dysfunction in men. Treat the periodontal disease, and erections can return. Another good reason to brush up. One University of Buffalo research project showed that people with diabetes require more than routine dental care. The study showed that incorporating systemic antibiotics along with dental cleaning can result in a reduction in A1C. Therefore, it is imperative to treat the chronic periodontal infection in a person with diabetes. If you have dental insurance, deductibles, co-pays and out of pocket expenses can be costly. If you have a health savings account option at work, you can use that money to pay dental expenses. If you don’t have insurance, there might be a local dental school that offers discounted services, or you may be able to find a dentist who will work with you on a payment plan. At any rate, you will want to prevent periodontal disease, or have it treated if you have diabetes. Let us know what you think about this article in the comments section below. We find comments and feedback useful, and use them to improve our teaching articles. I learned a lot from the article’s explanation on how diabetes can increase your likelihood for things such as periodontal disease. It just goes to show that if you are diabetic, it’s that much more important to get proper dental service performed regularly to keep your mouth healthy. 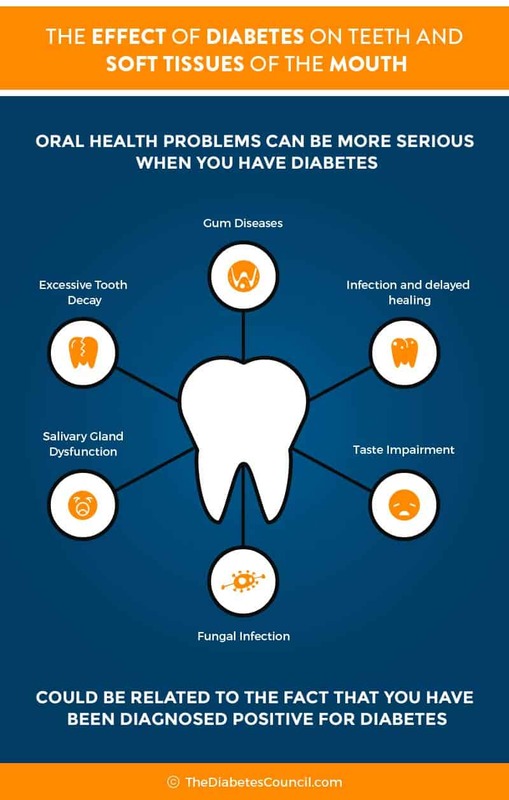 My mother-in-law has a high risk of developing diabetes, so I’ll make sure she knows about the dental risks that diabetes presents if she is ever diagnosed. Very informative….I don’t have dental insurance but I have a dentist that sees me ….I have had teeth pulled to the point that I can’t eat well….but can’t seem to loose weight even at thst….I am having to go to my dentist again this time for cleaning which I haven’t had due to pain afterwards but I have to go. THANK YOU for info….much appreciated. …..
Hi Elisabeth, thanks for sharing this very well-researched article. It was really helpful and informative. I particularly like the graphic representation that made each dental concept simpler to understand and I agree that frequent dental check-ups are a must in order to avoid any serious dental infections. Hi: This article is very informative about relationship between gum desease and diabetes. my wife has this problem. she already been seen by her pcp and dentist. After having this info will make it possible to work with them for her these health issues.